Kerala backwaters offer a unique experience to the travelers! 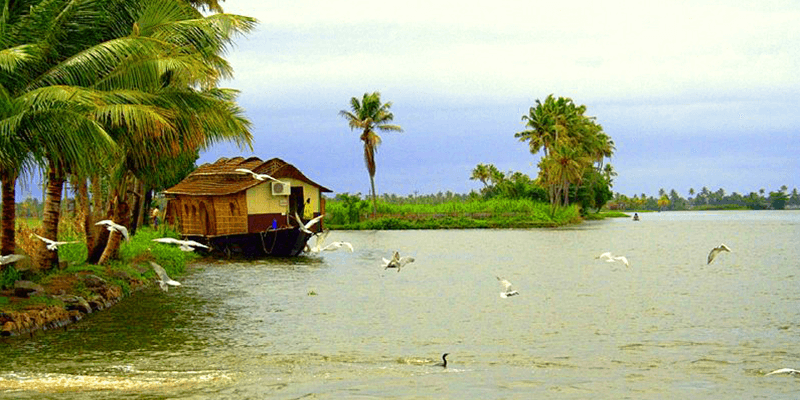 Kerala is blessed with a unique combination of rivers, canals, inlets and lakes which compliment ideally with its scenic landscape. Imagine: cruising on a houseboat through the narrow canals that are dotted with palm trees and beautiful villages. The sun plays an amazing hide and seek game by peeking through the clouds at intervals! You gaze through the houseboat at small huts and lush paddy fields, giving you an amazing visual treat. Sounds surreal right? When you think of the backwater experience it is mostly the Alleppey houseboats that come to mind. 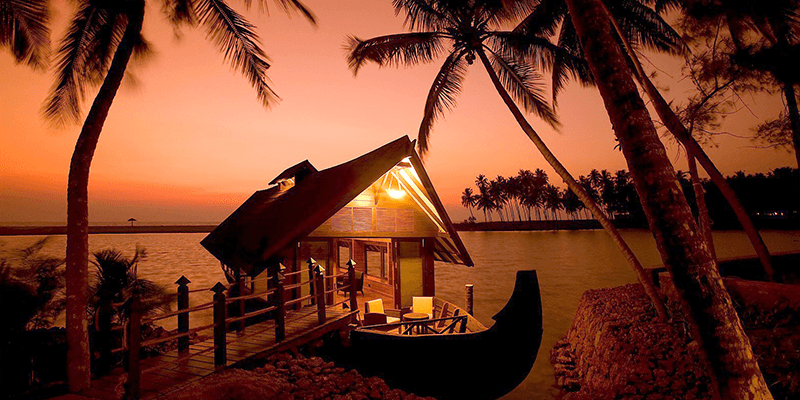 Yes, Alleppey is the jewel in the crown of Kerala tourism, but there are many other places in the state that offer an equally memorable Kerala house boat experience. And you know what, they are less crowded and more serene than Alleppey! So, avoid the beaten trail and visit the below mentioned unexplored backwaters gems of Kerala. Located towards south of Kerala, Poovar backwaters are slowly gaining momentum as a Kerala tourism hotspot owing to its beautiful backdrop, dreamy golden sand Poovar beach and the mangrove trees lined along the backwaters. Unlike Alleppey backwaters, the water level here is higher, as a result the palm and coconut trees on the shores remain half submerged. 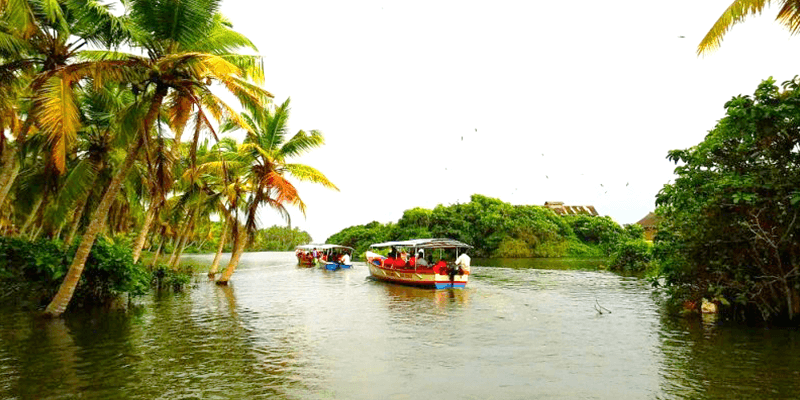 Poovar is closer to Kovalam and Trivandrum, which serves as a great excuse for tourists to skip Alleppey and experience the peaceful Poovar backwaters. While traveling in a Poovar houseboat, you would want to ask the boat man to go really slow, because there are plenty of great pictures to be clicked along the route! Tip: Don’t miss a sumptuous Keralean meal at floating restaurants situated on the shores of Poovar backwaters! Other activities: Bird watching and elephant rides. Nearby tourist attractions: Kovalam, Vizhinjam and Azhimala. 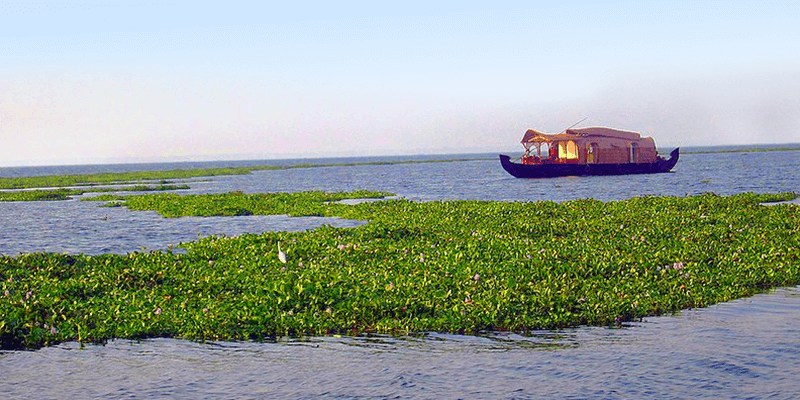 Kumarakom backwaters is the second most popular Kerala backwaters destination, after Alleppey. A visit to this city is amplified by a stay in the beautiful Kumarakom resorts. Some of the resorts overlook the gorgeous Vembanad Lake (second largest lagoon in India). If you are a birdwatcher then Kumarakom backwaters are your dream destination. You can spot myriad species of rare birds on the shores. Apart from the rare birds, the waters near Vembanad Lake are always decorated with colorful assortment of flowers. The Kumarakom backwaters lie in close vicinity to the Kumarakom Wildlife Sanctuary, which has been rated by many tourists as the most scenic wildlife sanctuary of Kerala. Tip: It is ideal to plan a Kumarakom trip around the Onam season. The iconic snake boat race, held as a part of the Onam celebrations, is a must-see event here. Other activities: Ayurvedic massage, shopping at Kumarakom market. Nearby tourist attractions: Kumarakom Bird Sanctuary, Aruvikkuzhi Waterfalls, Pathiramanal Island, Kumarakom Beach. Lying towards the south of Kasaragod district, Padanna village is one of the first theme villages in India. The tourists visiting this offbeat destination can experience Oysters and Mussels cultivation firsthand. And it is no wonder that the restaurants in the village serve a lip-smacking range of sea food! But the biggest attraction of this village is the unique Padanna backwater cruises. What is so unique about the Padanna backwaters? Well, the houseboat cruises here are offered on a moonlit night! The tourists get a chance to set sail under the blanket of stars, which will definitely leave you awestruck! Tip: While here, do visit Kareem’s Forest. It is a beautifully made plantation having a unique combination of spice plantations and vegetable farms. Other activities: Hit the rural pearls trail, visit Mussel farms, water zorbing, game fishing. Nearby tourist attractions: Udinoor Temple, Padanna Maqbara, Thrikarippur, Vellur, Nileshwaram, Kavvayi. Kozhiokode is where Vasco De Gama landed in 1498. Since then, Kozhiokode has become one of the major marine trading routes of India. Each year hundreds of international tourists flock to Kozhikode backwaters with an intention of enjoying its pristine beauty. The backwaters lie at the juncture of the Kallai River and the Beypore River. But unlike Alleppey, the houseboat tours have not become commercialized affairs, yet. And the river rides allow the tourists to enjoy the beautiful kaleidoscope of dynamic scenery! Other activities: Birdwatching, Trekking, shopping at Kozhikode market. Nearby tourist attractions: Pazhassirajah Museum, Kappad Beach, Dolphin Point, Kozhikode Beach, Beypore. Located in Northern Kerala, the Valiyaparamba backwaters etch scenic memories in your mind. Valiyaparamba does not feature in most Kerala tourism itineraries yet, and that keeps the backwaters here untouched and serene. 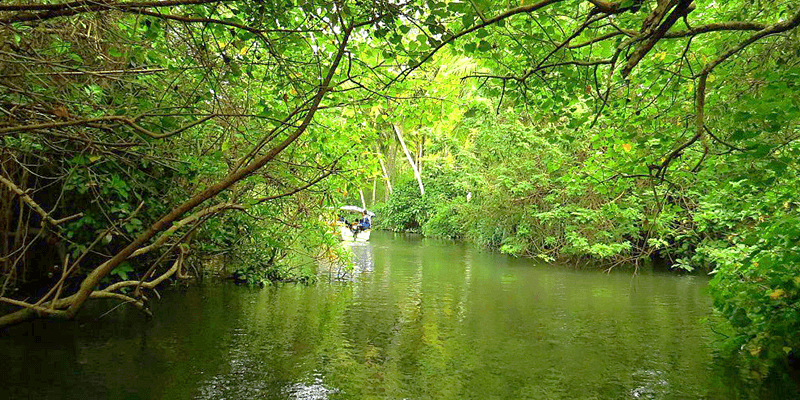 The beauty of the Valiyaparamba backwaters is further amplified by the presence of thick mangroves. There are many such mangrove trails, where you can enjoy a tranquil boat ride which might be interrupted from time to time by the chirping of birds. Most tourists like to couple the Valiyaparamba backwaters rides with a trip to the Bekal Fort (third largest Fort in Kerala). Tip: Valiyaparamba backwaters are a great location to experience fishing, the traditional way. The houseboats here come packed with local fishing equipment and the captain of our boat would be glad to teach you the art of fishing (fisherman’s way)! The second largest backwaters in Kerala, the Ashtamudi backwaters are a perfect place to relish your time, far from urbanity. Like Kumarakom, these backwaters are also lined with high end Ashtamudi resorts. If you are a photography buff, this is the place where you would want to be. Dotted infinitely with coconut trees and green paddy fields, these backwaters are the perfect places to experiment with your photography skills. Moreover, the traditional-styled food served in the luxurious houseboats is worth dying for! Tip: Try staying in the floating huts instead of a boat, while in the Ashtamudi backwaters. Floating huts are the uniqueness of the backwaters here. Other activities: Coconut husking, birdwatching, fishing, photography. Other tourist attractions: Munroe Island, Chavara South, Picnic Village, Thangasseri Beach. So, the next time you plan to visit the Kerala backwaters, ditch Alleppey and visit one of the above mentioned beauties. Land of gods. It is amazing and picturesque. Nice blog about Kerala backwaters. I must say its one of the best places to visit in India. I would definitely recommend a visit to these places and also have the wonderful food this state can offer. Really good research work and nice sentence framing in this blog. Good work. Exactly Kerala is an amazing destination to explore! Nice blog for anyone who wants to explore the real beauty of Kerala. Last year, I spend my vacation along with my family in Kerala at Ashtamudi backwaters. It was such a beautiful place and I highly recommend this place to be on the top of your list if you are visiting Kerala. There are so many resorts around Ashtamudi and nobody needs to worry about the stay. We stayed at The Raviz Resort and Spa there during our visit and everything about the resort was perfect – the location, food, and activities they arranged. One shouldn’t miss the traditional cuisines offered at its restaurant. Kerala is a wonderful and amazing in terms of water destinations. 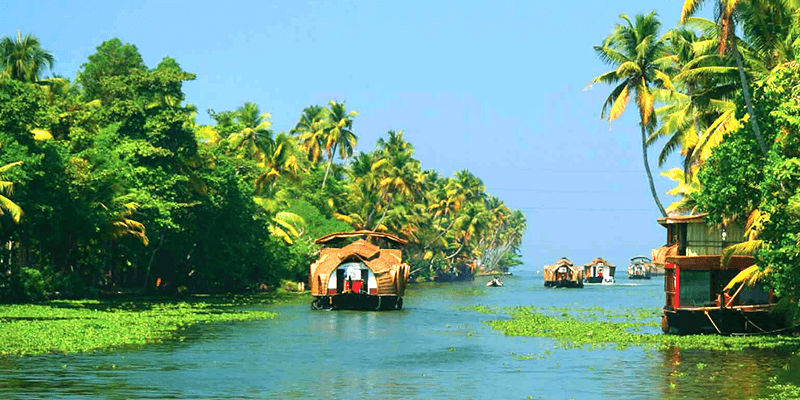 Kerala is one and only place, where you can get houseboats. 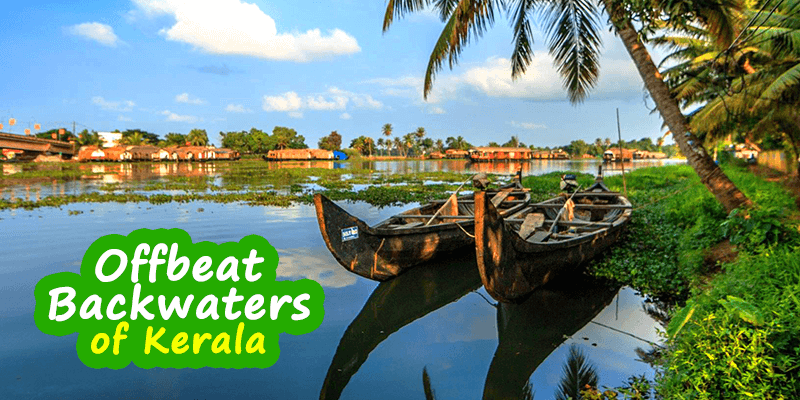 The blog amusingly pens down alternative backwater destination beyond Alleppey and to experience Kerala houseboat cruise some points are to be kept in mind. So Everything You Need To Know About Houseboats In Kerala & Backwaters Cruise is fabulously furnished in the blog.